So, New Year’s Day. What better hangover cure than a roast dinner? 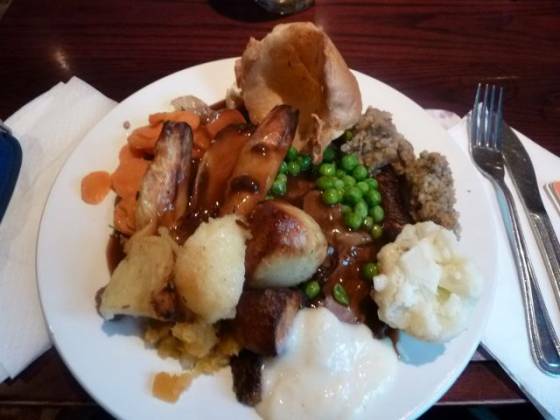 An ‘all you can eat carvery’ may be? 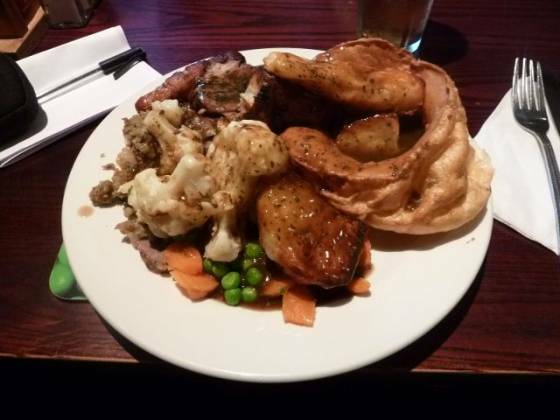 We at Best Sunday Roast have become quite snobby with our reviews, after 29 posts it would be hard not to. 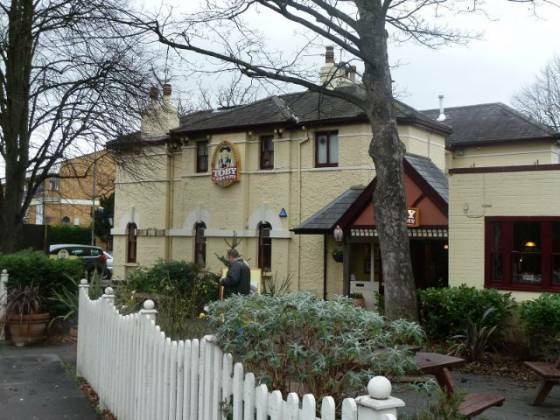 Claire and I were invited to The Crown, which is a Toby Carvery, a couple of weeks ago by my Auntie and her family. Whilst it is not cordon bleu, I could see the attraction. We didn’t review it last time, so I decided as a New Year treat (and to get me feeling a bit more human after new Year’s Eve! ), we should give it another go, with a review in mind. Our previous experience told us to get here early, it gets full very quickly, so Claire and I arrived at around 1pm. Upon walking through the entrance, we were greeted pretty much straight away and taken to our table, a two-seater near a window. There is also a bar area if you have just come for drinks (a refresher before/after eating). We were given menus and were asked about drinks, Claire went for a (bottomless) diet coke, I went for a mildly manly (not bottomless) lager shandy. Price wise, the shandy (and lager) was £2.85 a pint, very reasonable. Claire’s diet coke was £2.35 and ‘bottomless’, meaning she could fill up more whenever she wished – £2.35 is more than some pubs, but as long as you fill up more than once it then becomes better priced. They had an ok wine selection, pricing from around £10 up to £15 (and one champagne which was pricier). A couple of minutes later, the waitress brought our drinks over, asking if we wanted starters? You are allowed to get as much of the vegetable selection as you want with the carvery, going back for seconds (or thirds) if you wished. So with this in mind, we went straight for the main event. We were then told to go up when we were ready. As is customary in our reviews, I will give you a quick overview of the venue before the food. Our seating area was quite nice, on a slightly raised level with a number of other tables. Looking around, there was a complete mix of people, young and old, families and couples as well as a couple of people on their own. Toby Carvery seems to appeal to a wide range of audiences. They have some bizarre pictures on the wall, and the place mats were also a bit eclectic (my one showed how many vegetables they have available for kids to enjoy, Claire’s had a picture of a gigantic broccoli in some scenery). The table was simply laid, with cheap paper napkins and unfortunately some very dirty knives and forks (I had to go to a number of tables before finding some acceptable ones). On to the carvery experience! Around 10 people were in front of us with the queue to the carvery, later on the queue can get 20 or 30 people in length! There was a good selection of meat, being roast turkey, roast beef, roast lamb, gammon and roast pork. They was quite generous with the amount of meat served and everyone’s offered a yorkshire pudding. Previously, I went for a trio of meat but this time decided on just roast lamb (Claire had roast beef). Just to note, last time Claire felt she didn’t have enough meat whereas this time there was more. Once the meat has been sorted out, then on to the accompaniments. A mighty selection were on offer: carrots, peas, stuffing, pigs in blankets (small (maybe chipolata) sausages wrapped in bacon), swede, cauliflower cheese, parsnips, mashed potato and roast potatoes. We also saw people having brussel sprouts and broccoli, they must have run out before we got there. After filling our plates up (the pigs in blankets didn’t seem that inviting, I had to go through them before picking a halfway decent one), we moved to the gravy and sauces. I was surprised at the selection of gravy available – beef gravy, mint gravy (for lamb) and vegetarian too! Also, a good amount of condiments including mint sauce, horseradish and apple sauce. I stocked up on mint gravy and mint sauce, Claire had beef gravy and horseradish. First things first – the yorkshire pudding seems to be something Toby Carvery / The Crown seem to be proud of, and with good reason too! It’s so huge, it has to be home-made. It tasted very good too. The meat tasted ok, lamb was very much well-done, as was the beef – once again, I personally would prefer some pinkness with the red meat but I suppose they have to appeal to everyone. Claire’s roast beef unfortunately had a huge amount of fat running through the middle, which meant she was not able to eat it all. The roast potatoes were ok, very crunchy (I chose some burnt ones). The parsnips, peas and carrots were fine too – I avoided the swede and as mentioned earlier they did not have any brocolli or brussell sprouts unfortunately. The stuffing was quite nice and I quite enjoyed the pigs in blankets too, apart from the fact they were extremely greasy. The cauliflower cheese, whilst a very nice addition, was a bit of a let down as it wasn’t cheesy enough for me (I like lots of burnt / cooked cheese). I really liked the mint gravy, something I haven’t had in such a long time. Speaking with Claire, she thought her food was ok, although really did not like the horseradish sauce – it was too glossy and had very little flavour. There was so much food on our plates, neither one of us were interested in going up for seconds! After a couple of minutes of finishing, the waitress came over to ask about desserts. They have an ok selection of traditional options, including sticky toffee pudding as well as ice cream. We were so stuffed from the carvery though that both of us had to decline. Interestingly, within a minute or two of saying no to the dessert, the bill was presented to us. I felt a bit put out by this, as I was quite happy to have a tea and maybe another drink – they missed out on some extra business by rushing us. So, onto my conclusion. Toby Carvery as a group is quite popular, and with The Crown in Bromley I can see why. We were completely stuffed on one plate each, let alone having seconds. The bottomless drinks are a good idea if you have more than one, and the rest of the drinks were reasonably priced. The cleanliness of the cutlery and cheapness with napkins annoyed me, as well as being presented the bill straight away – it felt they were trying to get as quick a turnaround of tables as possible. Also, we missed out on some of the vegetables but to be honest we had so much choice anyway! As it stands, Toby Carvery is by no means gourmet. If you are looking for a relaxed venue or somewhere to go for a special occasion, this is definitely not for you. But, if you have a hearty appetite you could get a good value meal here.